When I am asked to name the most lethal human virus, I never hesitate to name rabies virus. Infection with this virus is almost invariably fatal; just three unvaccinated individuals have been known to survive. New evidence from humans in the Peruvian Amazon suggests that the virus might be less lethal than previously believed. Rabies virus is typically transmitted to humans by the bite of an infected mammal, often a carnivore or a bat. 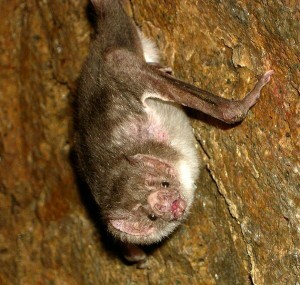 Recently there have been numerous outbreaks of rabies in Peru that have been linked to bites of vampire bats. A study of two communities at risk for vampire bat bites was undertaken to determine whether subclinical infection with rabies virus might occur. Over half of 92 individuals interviewed reported having been bitten by bats. Neutralizing antibodies against rabies virus were detected in 7 of 63 serum samples obtained from this population. Antibodies against the viral nucleoprotein were found in three individuals, two of whom were also positive for viral neutralizing antibodies. All 9 seropositive individuals indicated that they had previously had contact with a bat (a bite, scratch, or direct contact with unprotected skin). One of these individuals had previously received rabies vaccine. The finding of neutralizing antibodies against rabies virus suggests that these individuals were likely infected, but did not develop fatal disease. It is also possible that they received a sufficiently large dose of virus to induce antibodies, but that viral replication did not occur. Another explanation for the findings is that these individuals were infected with an unknown virus that is highly related to rabies virus, but which is not pathogenic for humans. There have been numerous seroprevalence studies of rabies infection in wildlife. For example, foxes and other canids have low (0-5%) seroprevalence rates, while 5-50% of bats can harbor rabies neutralizing antibodies, indicating that these animals are less susceptible to fatal rabies. In contrast, there have been few studies on rabies seroprevalence in humans. In one study of 30 raccoon hunters in Florida, low levels of rabies virus neutralizing antibodies were found in 2 samples. Low neutralizing antibody titers were also detected in 9 of 31 Canadian Inuit hunters; in a separate study, high rabies antibody titers were detected in the serum of 1 of 26 Alaskan fox trappers. All of these individuals had not been immunized with rabies virus vaccine. Rabies virus causes 55,000 human deaths each year, so even if the results of the Peruvian study indicate subclinical infection, they would have little impact on the nearly 100% fatality rate associated with infection. More extensive studies are needed to determine if nonfatal human rabies infection is more common than believed. Understanding why some individuals do not die after infection might reveal immunological and genetic factors that protect against the disease. Amy T. Gilbert, Brett W. Petersen, Sergio Recuenco, Michael Niezgoda, Jorge Gómez, V. Alberto Laguna-Torres and Charles Rupprecht. Evidence of Rabies Virus Exposure among Humans in the Peruvian Amazon. Am. J. Trop. Med. Hyg. 87:206 (2012). Would it be fair to say, then, that only rabies infections that >result in disease< are 100% lethal (with the exception of those 3 documental survivors)? Is it known whether those individuals in Peru who had seroconverted experienced any neurological symptoms after being bitten, however slight? I wonder if it's that once the virus gets going and replicating it will be about 100% lethal, and maybe the cases of seroconversion took place because the individuals received a high titer of virus through their bite but, perhaps due to some genetic resistance (lack of/alteration of the receptor? ), were able to seroconvert without replication of the virus even having to take place….is that even possible though? It would be fair to say that if you are diagnosed with rabies, there is nearly 100% chance that you will die. In other words, the case fatality ratio is 100%. The real question is of all those who are inoculated with rabies, how many die? The answer is not known because not many human serosurveys have been done. It’s possible that polymorphisms in, say, immune response genes, or even the viral receptor, lead to resistance such that little or no viral replication occurs and no lethality. Yes, you could seroconvert without replication: that is how many inactivated viral vaccines work. If you read the book MAD DOGS by Don Finley, in that book the CEO of RHONE MERIUX now MERIAL is quoted as telling the Mr. FIndley that “you know the rabies virus isn’t lethal”. He reported to Don Findley that despite working all his life with rabies and never being vaccinated that he had developed neutralizing antibody. This was also found in fur trappers and in Eskimo. In another article for Gun Dog magazine written by a veterinairain from Owl, Maine, she reported that your chance fo developing rabies from being bitten by a “known rabies dog” was 15%. Her article not mine, just saying.